Presenters (Left to Right): Dr. Ethna Lay, Dr. Jill Belli, and Dr. Laura McGrath. 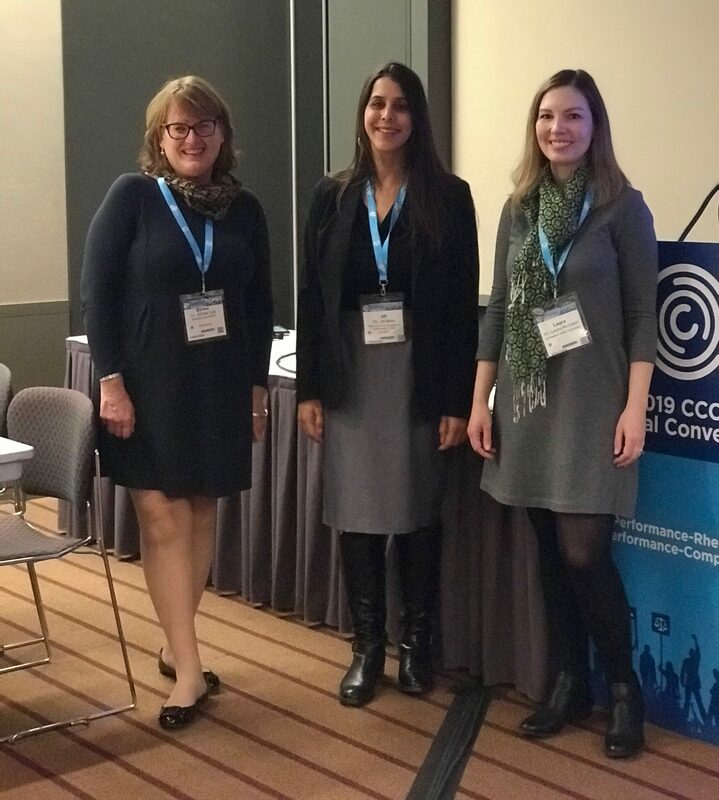 On Friday afternoon of CCCC 2019 in Pittsburgh, I had the pleasure of listening to the panel “Performing in the Open: Open Access and Visibility in Social Media Research,” which featured presentations by Dr. Jill Belli, Dr. Ethna Lay, and Dr. Laura McGrath. Each presenter on the panel passionately discussed research projects that promote access to social, collaborative digital spaces for students and users. I am delighted to share a summary of their presentations and the key takeaways gleaned from their research. Dr. Jill Belli began the panel with her presentation on City Tech’s OpenLab. Developed in 2011, OpenLab is an online digital platform open to all students affiliated with City Tech that serves as an internal site for the sharing of knowledge, the storing of content, and the collaboration of users. When Belli (the co-director of OpenLab) and her team created the program, they were hopeful for a few thousand users; it currently has 28,000 members consisting of current students, alumni, faculty, and staff of City Tech. 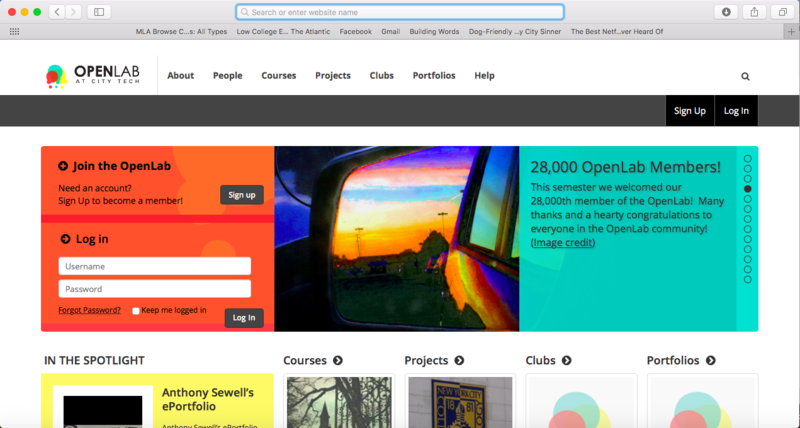 The site houses not only user-created profiles, but also digital portfolios, blogs, courses, student organizations, and more to establish a thriving online educational community. When describing the architecture of the OpenLab, Belli explained, “We have an ethos of openness—of an open lab of experimentation—of collaboration, and especially of community building, which is really at the heart of what we do. We want the platform’s design to embody those values.” This spirit of collaboration, community, and openness has allowed the program to grow beyond what its original creators could have imagined. Now, the OpenLab program is available for other universities and colleges to customize and implement under the name Commons in a Box. According to CUNY’s October 2018 announcement about the software, Commons in a Box is “specifically designed to support teaching, learning, and collaboration. Unlike closed online teaching systems, it allows members to share their work openly with one another and the world. Like a lab, it provides a space where students, faculty, and staff can work together, experiment, and innovate.” Perhaps best of all, the Commons in a Box software is free for institutions, departments, and teachers to download and use. Those interested in learning more about the program can peruse the public projects available on City Tech’s OpenLab and download Commons in a Box. Lay grounded this notion of identity projection (via a screen) in Jill Walker’s “Mirrors and Shadows: The Digital Aestheticisation of Oneself” before she examined the self imagery that students choose to share on their blogs. Lay’s research indicates that students can experience moments of valuable identity exploration through online composition. Dr. Laura McGrath gave the panel’s final presentation. McGrath offered case studies of how several women on Instagram, all over 50 years of age, constructed their identities and performed age on the social media platform. Using non-intrusive observation (studying hashtags, comments, emoji use, etc. ), analysis of public profiles and published interviews, and a survey, McGrath found that many of the women were specifically concerned with their identity as they aged. For them, Instagram proved to be a community of support as they navigated life post-50. McGrath said, “They found Instagram to be an inspirational, empowering, and encouraging community of women, and on the site they value authenticity, realness, and originality.” The women McGrath interviewed revealed that they use Instagram primarily to connect, inspire, promote themselves (for those who are influencers), have fun, and express themselves. Instagram became the outlet needed for identity formation for the women in McGrath’s study. Recently published in Literacy in Composition Studies, “Achieving Visibility: Midlife and Older Women’s Practices on Instagram and Blogs” captures McGrath’s research in writing and is available as an open-access PDF. The three presentations worked together well to investigate identity performance and composition in online spaces. There are two overarching theoretical takeaways that I learned from these scholars. First, the research presented during this panel spoke to the positive use of digital writing in the composition classroom. Despite the numerous studies in our field about the importance of integrating technology into the classroom, it seems as if the implementation is slow to catch on, especially in first-year writing programs (see Jackson and Weaver’s introduction to Writing in Online Courses for a brief exploration of assumptions about online learning and writing). Both Belli and Lay examined the potentialities of digital composition in ways that enhance classroom learning. Second, identity performance is integral to online communications, as Lay and McGrath argued. A majority of students’ communication today happens in online environments, from emails and texts to social media posts and blogs. Bringing these platforms and technologies into the classroom offers students the space to study and experiment with the identities they digitally create. Overall, “Performing in the Open: Open Access and Visibility in Social Media Research” provided interesting insights into digital composition as it interacts with the classroom and identity formation. Megan Busch is a doctoral candidate at the University of South Carolina with research interests in the rhetorical function of Southern language varieties, the methods and methodology of discourse analysis, and composition pedagogy (both traditional and digital).